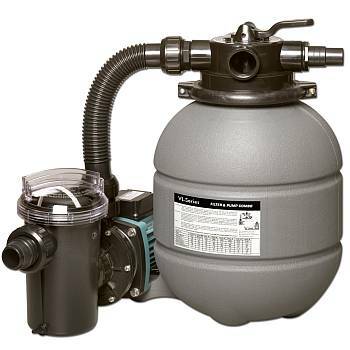 The Hayward VL Series Pump and Filter system is a perfect replacement for the cartridge filter systems that come with Soft sided pools such as Bestway, Sun N Fun and Intex. Sand Filter technology allows for extended time between cleanings. Cartridge elements provided with many softsided pool systems must be replaced regularly. The VL Series Filter has a two piece flange clamp design which makes it easy to install and service. The pump has a hair and lint strainer basket attached which prevents large debris from clogging the pump inpeller. Pumps provided with many soft-sided pools do not include a strainer basket, which increases the potential for clogged impeller. The system includes a 30 GPM pump with a 13 Inch sand filter. It also includes 1.25 and 1.5 inch hose adapters to work with a variety of pools. The filter holds 42 lbs of silica sand and features a multi-position valve which provides maximum flow at low pressure drop. It also has an integrated pump base to allow for a secure connection. The pump is designed for incredibly quiet operation with minimal energy consumption. It also has a clear cover that lets you see when the basket needs cleaning. filters provided with many soft-sided pools. Made with corrosion-proof, molded thermoplastic.